So now we have the replacement for SMACKGIRL. A press conference was held today at the Fitness Shop Fighting Academy to announce a new women's MMA company called JEWELS. They will have their debut show on Nov. 16 at Shinjuku FACE. It's being described in the Japanese media as SMACKGIRL's daughter and there are some SMACKGIRL people involved but the company will actually be affiliated with DEEP and will recognize DEEP Lightweight Champ MIKU & DEEP Flyweight Champ Satoko Shinashi. The money mark...er...owner of JEWELS owns a company called Marveras. He's been a fan for many years and expressed interest in SMACKGIRL recently when he read about their problems but decided to change the name because of the negativity surrounding the SMACKGIRL name. The general manager and matchmaker is former DEEP employee Shigeru Saeki. There are some SMACKGIRL people in the front office but Saeki will be in charge of the in ring product. He talked a bit about hopes of signing Megumi Fujii but he did say that the top fighters in SMACKGIRL will be the top fighters in JEWELS. The major difference between VALKYRIE & JEWELS is that JEWELS will be in a ring as opposed to a cage. You can't fit a cage in Shinjuku FACE. Differ Ariake is a much larger hall. Shinjuku FACE holds about 500 fans. It's just cheaper to run there and it's why many Japanese MMA companies have their matches in a ring. JEWELS announced four matches for the debut show on Nov. 16 at Shinjuku FACE. They plan to add four more. All matches are scheduled for two five minute rounds. 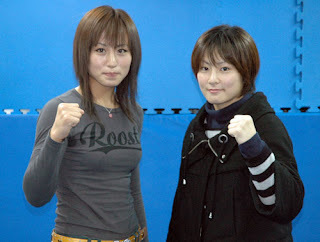 The main event will be a 52kg match between Saori Ishioka (right)& Mika Nagano (left). Ishioka's record is 5-3 and her last fight was a win over HARUMI at the Aug. 6 Summerfest show. Nagano is a former amateur wrestling champ at Nagoya University. Her record is 1-1 and her last fight was a win over Asami Kodera on the Apr. 26 SMACKGIRL show. A 49kg match will have Misaki Takimoto vs Masako Yoshida. Takimoto is 8-9-4 and most recently lost a DEEP Lightweight Title match to MIKU on the Aug. 17 show. Yoshida is 14-13-5 and most recently won over Asami Kodera on the Feb. 14 SMACKGIRL show. A 48kg match will have Sachi vs Kaneko Kazumi. Kazumi appears to be making her debut but SACHI is 4-3-1 and most recently won over Kayo Nagayasu and then lost to Satoko Shinashi in the Feb. 24 DEEP Flyweight tournament. A 60kg match will have HARUMI vs a debuting fighter named Shizuka Sugiyama. HARUMI is 0-8. More matches will be announced. Let's all wish JEWELS the best of luck. But there are too few women to 'sign' to a specific promotion. :( But that's the reality....so much political complicated stuff! Wow... Saori Ishioka is really photogenic! What now for Gina Carano?